Our band, the RCMP E. Division Pipe Band will be playing for a Shriners Burns Supper. And individually, a number of pipers will be breaking out “A Man’s a Man for A’That” and other appropriate tunes for the occasion. Around the globe, kilts will be dusted off, ghillie brogues shined, whisky bottles taken down from the shelf, songs and poems given voice and a collective cheer will rise to celebrate Burns life once again. It’s the first big event of the year and hopefully the beginning of a great year for all. Will SFU recapture the World’s title this year? Will Triumph Street break into the top five? Who will compete in the Grade II category in the BCPBA? On the non-competition side, we’re hoping the West Vancouver Fire Department hosts the Bagpipes on the Beach (Beach Bags?) Festival in June. And we all hope, and pray, that the rain stays away this year for the Coquitlam games in June. For the RCMP Pipe Band, we are preparing for the Davis Cup in February and a number of other events that have us back at our practice facility in New Westminster and new tunes on our music stands. 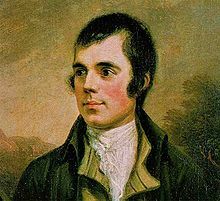 For now, however, it’s all about Robert Burns. Then back to practice….and thoughts of warm spring and summer nights, filled with pipe music.